Contempo was created following the idea of the artist raya georgieva (1978 -2009) and implemented by raya georgieva foundation. Contempo 2013 partners: association for cultural management sea blue, tereza art gallery , stalker studio,gallery 10, bulart gallery, contemporary space, arhis gallery , graffit gallery, cubo bar, city art gallery “ boris georgiev”, la playa, varna municipality, horizont complex, yoho hostel, varna archaeological museum, art department of regional library. Contempo -contemporary art festival is a noncommercial platform to encourage, present and promotе the art production of young authors up to 35 years old. The forum is settled to present a dynamic version of creative searches and trends in the younger generation of art, to promote their work and provide a stage for the realization of their artistic provocations. In contempo except for traditional art spaces are absorbed unconventional spaces as well, being promoted to a new culture and aesthetics, close to the interests and attitudes of young people in urban environments. Since its first edition in 2009 the festival was attended by more 12,000 people. Raya georgieva foundation (rgf) is based in varna since 2010. it main objectives are to keep the memory of the artist’s talent and creativity of raya georgieva (1978-2009); support young artists to realize their idea; create a stage for dialogue and creative experimentation. 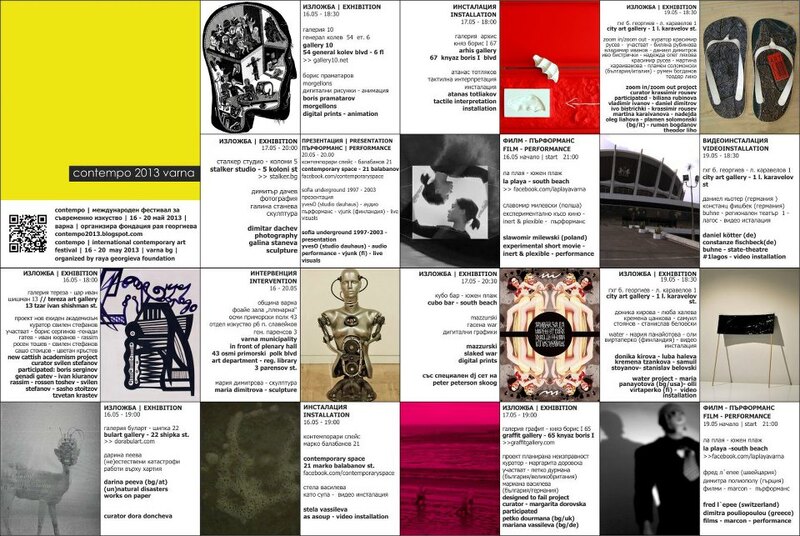 Contempo 2013 is curated by dora doncheva. guest – curators: margarita dorovska, krassimir rousev, svilen stefanov, yovo panchev.